University of Michigan Obstetrics and Gynecology faculty members and students are engaged in various programs of education, research and service in a number of countries. At Korle-Bu Teaching Hospital in Ghana, researchers are utilizing fetal assessments, not available to most obstetricians in Ghana. Initiatives are currently being formed to enable academic centers to go out to rural cites for fetal assessments. Another research project in Ghana is an evaluation of facilities with and those without obstetricians to numerate the differences in terms of cases of complications treated per delivery. Through initiatives like these, University of Michigan faculty and students are hoping to reduce the current 10% rate of unexpected still births at Ghana teaching hospitals. Our department regularly hosts medical students and post graduate trainees from Africa and Asia, and our residents have opportunities to complete their electives abroad. Additionally, the Department has been involved in the Ghana-Michigan Collaborative Health Alliance Reshaping Training, Education & Research (CHARTER) Program funded by the Bill and Melinda Gates Foundation. 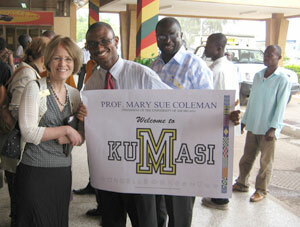 This 3 million dollar learning grant explores how to improve human resources in Ghana to improve health. It involves researchers from the University of Michigan, University of Ghana, KNUST, and the Ghana Ministry of Health to understand the educational, health systems and research needs in Ghana and to co-create new methods of partnership and collaboration. Adapting Michigan maternal mortality review system to the developing countries setting. Global Initiatives is working with Haiti's Ministry of Health to improve surveillance for maternal mortality. The surveillance tools could be used nationwide in Haiti and can be adapted to any country context. The programs already established in Ghana have been extremely successful, particularly in the areas of capacity building, medical infrastructure development, and sustainability. Using the lessons learned in Ghana, in particular in relation to collaborative, long-term partnerships; those experiences can be modeled to affect the global public health initiative. University of Michigan hopes to be on the cusp of a new era of global health in medicine, away from the hero model, and toward a co-creative model where global health problems are solved by adapting known solutions to new environments and sustainable capacity is created. To learn more about supporting our Global Health Initiatives program, please contact: OBGYN-Global@umich.edu.